One of the dreams of Lewis was to have a way of exposing African-American children, on the things that inspire pride and prove to them that they are an invaluable part of American society. Lewis’s dream come true as the Museum of African and American History and Culture. When museum opens in June, near the Inner Harbor, it bacome the largest museum on the East coast and the second largest in the country. The museum presents the work of the most famous black men in American history, which accidentally were residents of Marylandn. The list includes Benjamin Banneker, Billie Holiday, Thurgood Marshall, Cab Calloway, Harriet Tubman, and Alan Locke and Frederick Douglass, and its just few names. The museum will also honor the many ordinary people in Marylands history of the introduction movement of slavery civil rights. The battle for the museum has been long and difficult. The idea of the museum was the birth of the Pete Howard Rawlings. It was then considered by the controller, after by governor William Donald Schaefer. Governor Schaefer convinsed the lawyer, George Russell, to take the lead as the chairman of the commission, established by the General Assembly. Mr. Russell was the first black judge that sit on the District Court of Maryland, as well as the city’s first black lawyer and chairman of the Bar Association. Information about the transaction with the state were huge. Museum cost was 34 million. The state will give 31 million, plus 2.4 million аnnual operating costs for several years. The main obstacle was the fact that US 3 million should be raised before the state will release its funds. The first major hurdle was overcome when one half of the amount needed was provided by Peter Angelos, a lawyer and owner of the Baltimore Orioles. The next step was raising to 25 million for donations. Reginald Lewis Foundation steps with a gift of 5 million. Mr. Lewis is in the museum and in the history of African-American Marylanders recognized in the name of the museum. Fundraising took the gift, and only 25 million has been raised. Impressive 5-storey building on a black granite Pratt and President streets. Red wall passes through the building like a red river of tears. To enter the building, you’re like water mist provoking journey from Africa to the shores of Maryland. Reginald F. Lewis Museum including itself current state of the gallery, interactive learning centers; permanent, special and traveling exhibitions; distance learning in the classroom provided by Verizon Communications; genealogy resource center and an verball history recording and listening to the studio; 200-seat theater hosting intimate performances and symposia, museum shop as well, a cafe with roof terrace for special events and entertainment. Advanced building technology and brilliant design have convinced many people to choose the museum as a repository for family treasure of historical significance that have been carefully collected by museum staff. 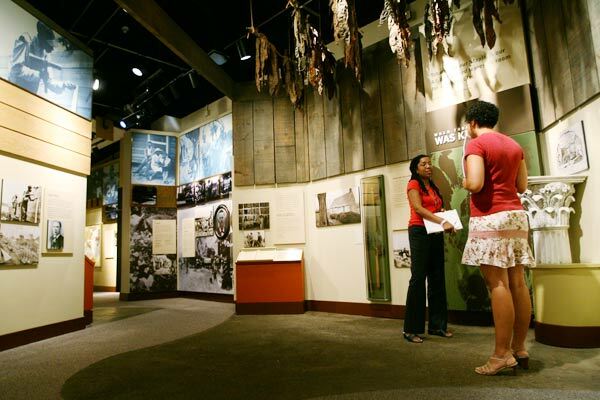 No less important fact that the museum is working with the Maryland State Department of Education to convert a 850,000 Maryland public school students to learn about African-American history. Students from across the state will be able to visit the museum. Students will use a special entrance and will put in the waiting area for a unique experience. Common lessons and activities that have been designed included to the program. The aim is in point of students to fully explore the contributions of African Americans Marylanders, both famous and obscure, and to understand their 400 years of struggle better. In june we are, like society in general with harbor breath waiting for the triumph opening of the Reginald F. Lewis Museum in Maryland – African American History and Culture.